Extra large travel poster scratch off map (Deluxe Edition). Scratch off the places you’ve visited! Perfect for the travel enthusiast. We ship worldwide! Looking forward to traveling this year? 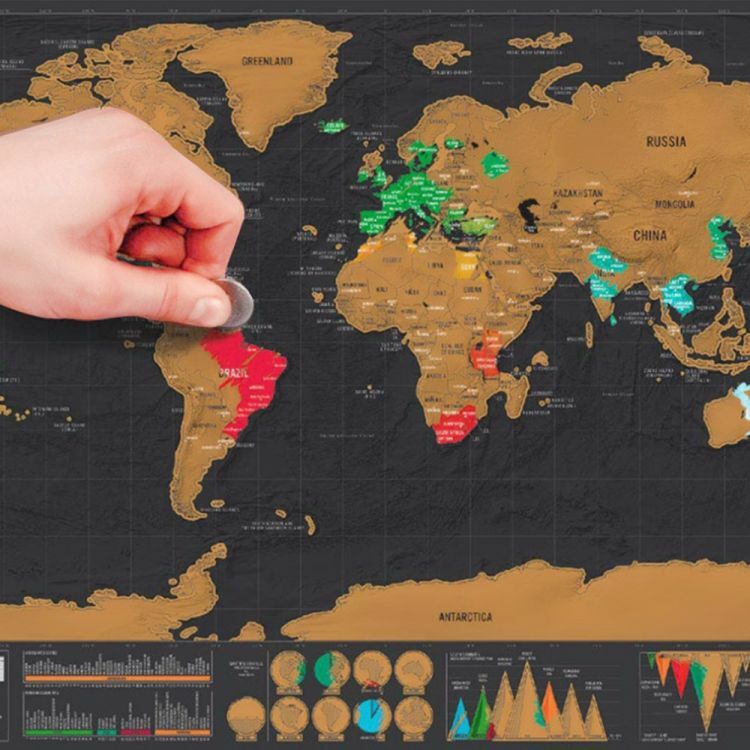 Show your adventurous spirit and scratch off the countries and places you have visited with the deluxe edition of the scratch off travel map. Made of laminate, card and colored foil, this highly detailed version features additional islands and cities with spectacular info-graphics graphically showing and portraying facts and information about the islands, lands and oceans. Map features great vivid colors and geographical detail. With a large size of 82.5 cm by 59.4 cm, it is perfect to post in your living room or office wall. Watch your friends’ expressions as they get excited when they see the places you have visited! A truly inspirational gift for all travelers. Continents are divided by countries to allow for more personal customization as every adventuresome spirit is unique. Each country is made up of an different underlying color. The gold foil makes it easy for you to personalize your map to all the places where you have been. Some of our customers have added markings of their own, painted over certain regions or countries, added flags, pins, nautical dashed lines representing the path of a sailing route, even pictures and photographs. The map will be like in the pictures. Personalize it as your creativity allows. Hang it by itself on the wall or put a frame around it, either way looks great! Are you constantly on the road or on the move like some of us here at the backpacking team? Then take it with you, especially if you are going on solo or months long trips. The map is packaged in a very slick gift poster tube for an increased adventuresome sensation and added safety. NOTE: Please allow 2 – 4 weeks for promotional shipping items depending on shipping location. All items are guaranteed delivery. Tracking information will be generated for most countries and provided upon request. Check out securely via Stripe or PayPal. Limited units available. Due to the nature of our promotions, if you see a page “out-of-stock” then message us and we will let you know when we get more items on stock!